For other uses, see Desecration (disambiguation). "Desecrates" redirects here. It is not to be confused with Descartes. Many consider acts of desecration to be sacrilegious acts. This can include desecration of sacred books, sacred places or sacred objects. Desecration generally may be considered from the perspective of a particular religion or spiritual activity. Desecration may be applied to natural systems or components, particularly if those systems are part of naturalistic spiritual religion. To respectfully remove the sacred character of a place or an object is deconsecration, and is distinct from desecration. Some religions, such as the Roman Catholic Church have specific rules as to what constitutes desecration and what should be done in these circumstances. "I peacefully removed your gods...there is no such thing as robbery for those who truly possess Christ." "for that all superstition of pagans and heathens should be annihilated is what God wants, God commands, God proclaims!" "If any images stand even now in the temples and shrines...., they shall be torn from their foundations...The temples situated in cities or towns shall be taken for public use. Altars shall be destroyed in all places." Sacred sites were now appropriated by Christianity: "Let altars be built and relics be placed there" wrote Pope Gregory I, "so that [the pagans] have to change from the worship of the daemones to that of the true God". 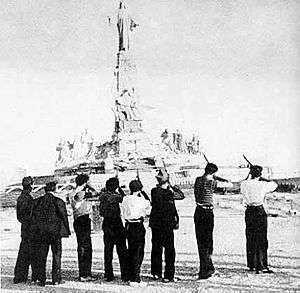 "Execution" of the Sacred Heart by leftist militiamen at Cerro de los Ángeles near Madrid, on 7 August 1936, was the most famous of the widespread desecration of images and Churches. King Alfonso XIII had consecrated the nation to the Sacred Heart of Jesus at the spot on May 30, 1919. The photograph was taken by a Paramount newsreel representative and originally published in the London Daily Mail with a caption calling it part of the "Spanish Reds' war on religion." The Red Terror in Spain during the Spanish Civil War involved massive desecration of churches, synagogues and other sacred objects and places by leftists. On the night of July 19, 1936 alone, 50 churches were burned. In Barcelona, out of the 58 churches, only the Cathedral was spared, and similar events occurred almost everywhere in Republican Spain. All the Catholic churches in the Republican zone were closed, but the attacks were not limited to Catholic churches, as synagogues were also pillaged and closed, but some small Protestant churches were spared. Even in the late 20th and 21st century, desecrations are still taking place in some parts of the world, notably in countries ruled by religious fundamentalists, such as the destruction of the Buddhas of Bamiyan by the Taliban in March 2001. In 2014 a man and a woman received jail sentences for attaching bacon strips to door handles of Edinburgh Central Mosque. ↑ "Desecration". Catholic Encyclopedia. Retrieved 2007-02-17. ↑ "Theophilus", Catholic Encyclopedia, 1912, New Advent Web Site. ↑ Ramsay MacMullen, "Christianity and Paganism in the Fourth to Eighth Centuries", Yale University Press, 1997. ↑ Mitchell, David J. (1983). The Spanish Civil War. New York: Franklin Watts. p. 45. ISBN 9780531098967. ↑ Mitchell, David J. (1983). The Spanish Civil War. New York: Franklin Watts. p. 46. ISBN 9780531098967. ↑ "Pair jailed for Edinburgh's Central Mosque bacon attack". News - Edinburgh, Fife & East Scotland. BBC. Retrieved 23 June 2014.